Excellent craftsmanship is shown throughout this amazing belt buckle! This piece of Native American jewelry is Navajo crafted by the artist Raymond Begay, out of genuine sterling silver, along with real Turquoise and Coral chip inlay. The inlay is gently set, while an incredible display of silver work can be seen forming a Kokopelli design and imprinted border patterns. 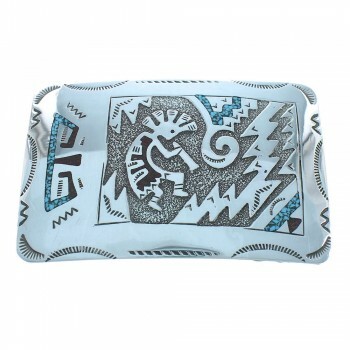 Kokopelli, The Kokopelli is a common fertility symbol throughout the Southwest. In Native American beliefs, the Kokopelli visits various communities, seducing and impregnating the young women drawn to the tones of his flute playing. The stunning detail in this piece will be sure to draw plenty of attention! 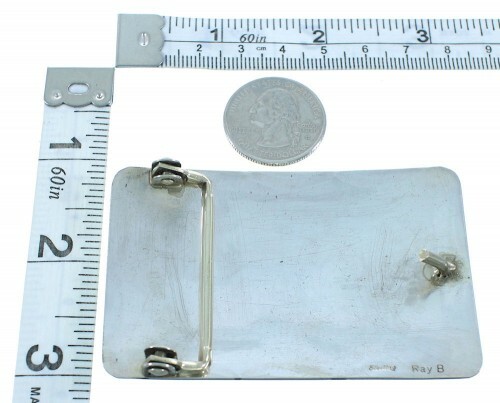 Belt buckle is stamped sterling and hallmarked by the artist.